Some of you may know or have learned that I am strangely obsessed with Publix grocery stores. When I first moved to Tennessee, I knew I wasn’t going to have my home go-to grocery store, Pick ‘N Save, and that was kinda sad. But it ended up turning out fine because PUBLIX IS EVERYTHING. When I tell you that I am obsessed with Publix, I damn well mean it. I have big love for Publix, and I would be one of those people wearing an I Love Publix apron, sipping from an I Love Publix coffee mug. Reason #1: Publix has what is called Aprons Simple Meals. What is that? Well, allow me to enlighten you. Usually located not too far from the produce section is a small cooking prep area with a smiling, friendly associate who is cooking up something delightful for you to sample. Sometimes the recipe is dinner, sometimes it’s dinner and dessert, but whatever it ends up being, it is ALWAYS tasty. Second of all, there is a handy dandy recipe card you can pick up. It lists out the ingredients and the recipe you just sampled, including nutritional information. Most Aprons Simple Meals take about 40 minutes or less to prep and cook from start to finish. Now for me, that’s very do-able on a weeknight. And although there is a featured meal, there’s an entire carousel of recipes to choose from if you want other ideas. 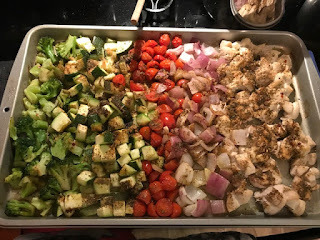 Finally (and this is the best part), if you go just around the corner from the meal prep station, you have everything you need to make the recipe RIGHT THERE IN FRONT OF YOU! You don’t have to run around all over the store trying to find all of the ingredients! I’m talking veggies, meat, spices, bread, salad, dessert, wine—all the works are right there in this refrigerated little alcove! It’s glorious beyond measure. 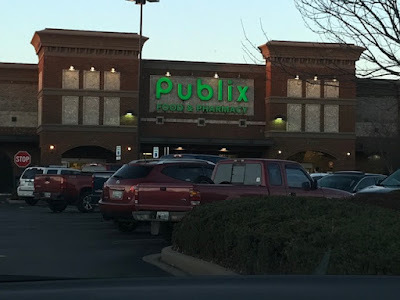 Reason #2: Publix has everything you need—their selection is very diverse, and I never leave without something I have to get from another grocery store (I’m looking at you, Kroger!) Even the weird stuff you have never used or knew you needed before. When I come across a weird ingredient I have never bought or have no idea where it is located in the store (cough, cough, capers, leeks, ponzu sauce, barramundi filets), first of all, I Google it to see what it is and what type of packaging it’s in (can, box, or jar) to clue me in as to where I might find it. Then, I jump on the Publix app or website on my phone, and it will tell me what aisle or section of the store that ingredient is located in. One time I was looking for a salad dressing in the dressing aisle (obviously), and I couldn’t find it on the shelves, so I busted out the app and BAM! It was actually located in Produce. HA! How silly of me to look amongst the dressings. Reason #3: The clubs. The subscription variety, not the booty shaking variety, BTW. You can become part of the Publix Paws, Wine, and/or Baby Club for no cost, and you will receive emails and snail mail flyers with special deals and coupons. Love this! I have learned so much about wine through their wine club emails, featuring specials and new releases, along with educational tidbits and recommendations. Reason #4: Speaking of emails, Publix emails out a weekly flyer with coupons you can clip digitally. Basically, you just enter in your phone number at checkout, and your clipped coupons will be activated. You can also save trees by electing to have your store receipt emailed to you, vs. printed out. Reason #5: Samples. Especially on weekends, there is usually some sort of amazing sampling going on throughout the store, strategically placed in the deli, bakery, and seafood areas in particular. Especially around the holidays. So come hungry, leave happy! Reason #6: The FOOD. Oh my goodness, if you haven’t had a #PubSub (Publix sub) or wrap from the deli, or even their fried chicken with sides for lunch or dinner, you haven’t LIVED! Their subs and wraps are always fresh and delicious, and you can put whatever you want on them. Reason #7: Their bakery. I haven’t had a single bad bakery item from there, but their cakes are a favorite at my work amongst my co-workers and myself. Chocolate ganache cakes, cookie cakes, strawberry cakes, cupcakes, you name it—it’s all SO good. Reason #8: Their customer service. Everyone is super friendly and nice (a la Chick-Fil-A style, minus the “My pleasure.”). They will even load up your shopping cart and take it out to your car and help you load up your car. I always have to fight them to say I will take it out myself! But I love the idea of it for preggo moms, the elderly, and the disabled, who just need a little extra help. Need to return something? They also make it super easy on you. I had bought the wrong thing and was able to return it without a receipt AND receive cash back, no questions asked. Reason #9: Their stores all have pretty much the same layout. This is helpful when I am in a hurry or am shopping over my lunch hour, because I know roughly where everything is that I need, so that I can plan my shopping course to be in and out quickly. Reason #10: They are festive AF. No matter the holiday, they have you covered with balloons, card, food to match, candy, decorations, etc. Superbowl? St. Patrick's Day? Easter? Fourth of July? ALL COVERED AND SO MUCH MORE. So if you have never been to Publix, I invite you to visit one as soon as humanly possible, and experience one for yourself. I promise you won't be disappointed! 2. Curry tuna salad lettuce wraps with cucumber slices, hard-boiled eggs, almonds, grapes, and apple slices: https://damndelicious.net/2017/07/02/tuna-salad-meal-prep/ (I used the following recipe for the curry tuna salad from the America’s Test Kitchen Quick Family Cookbook: Combine 4-5 cans of tuna (flaked), 1 cup mayonnaise, 2 minced celery ribs, 1 cup quartered red grapes, 3 tablespoons lemon juice, 4 teaspoons curry powder, and ½ teaspoon Dijon mustard in a bowl. Season with salt and pepper to taste. Scoop ¾ cup over 2-3 romaine lettuce wraps per meal prep container. The simplest first step you can take is to find some recipes you like and want to try, and pin them on Pinterest. That’s exactly what I did! I have an entire board devoted to lunch ideas. That way, I can try things out at my leisure. Invest in some good meal prep containers. I like the divided ones, but you can get plastic or glass ones from the grocery store, Target, etc. I bought 10 so that I never run out of them! Also check to see if the plastic ones are BPA free if you will be heating them up in the microwave. It’s also not a bad idea to get some Jell-o shot containers for dressings and sauces. Make the food! This is the fun part. I always plan to make 6-7 meals per week. This way, if my husband is home, he can try a few as well during the week. And if I have extras over the weekend, this makes a quick Saturday lunch as well. Budget your time on Sunday. How long will the prep and cook time take in total? Don’t start cooking too late at night. Keep track of what meals you like, and rotate them, so that you don’t get sick of eating the same food all of the time. I like variety! What are your favorite meal prep recipes?